A few months ago, Elon Musk famously launched his own car into space on top of SpaceX's Falcon Heavy rocket. It was an unprecedented stunt, and one that's unlikely ever to be repeated, but last week the world saw another Tesla launched skyward . . . this one didn't go nearly as well. There's been a lot of coverage lately of a 2016 model Tesla that managed an impressive leap on a residential road in the town of Barrie, Ontario. Most news reports explain that the vehicle was traveling at a high speed a when it launched off a steep run-up to a railroad crossing, and ended up airborne for over a hundred feet. 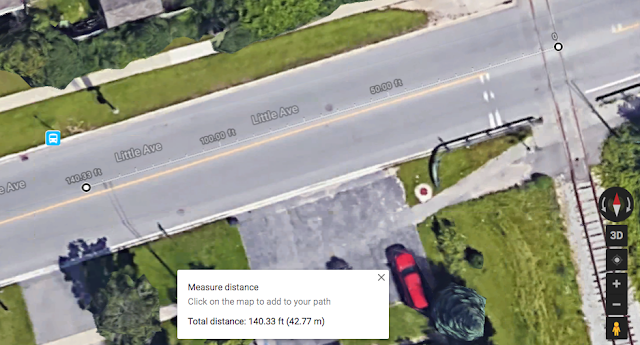 The video is impressive, but a little sleuthing can add a lot of precision to the news reports' very rough estimates of the car's speed and flight distance. 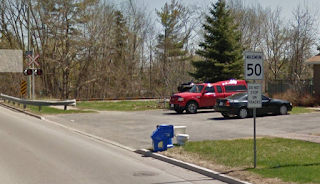 News reports say the location of the jump was at a railroad crossing on Little Avenue in Barrie, and that the car struck a tree on the property of a public school after losing control following the leap. That's enough information to narrow the event down to a specific stretch of road on Google maps. If you compare the security camera video to the Google street view, it looks like the Tesla traveled a good deal more than 100 feet. In fact, I'd put the distance at closer to 140 feet (42 meters). The other bit of info you can get from the video is the duration of the flight. I timed it with my g-shock wristwatch, which has a precision of 0.01 seconds, to about 0.70 seconds total flight time from the moment it leaves the ground at the tracks to the moment it nose-dives into the asphalt. ...which is about 130 mph, for the imperial system fans out there. 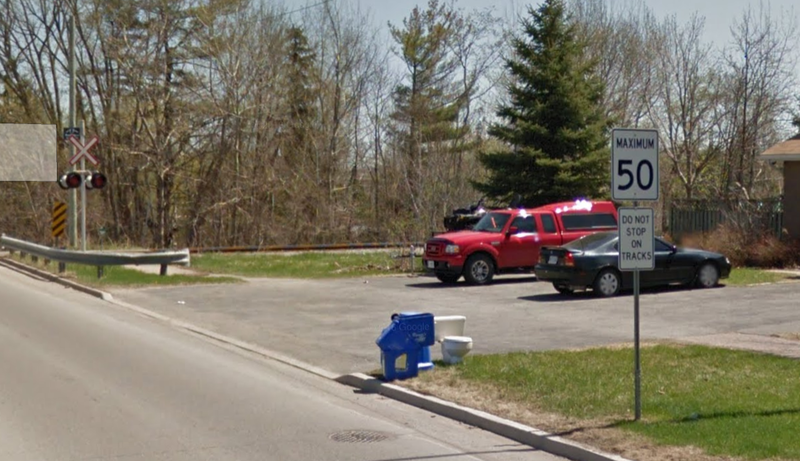 A quick trip down Little Avenue on Google street view reveals the speed limit in that area to be 50 kph. Bonus Calculation: How High Did He Fly? Thanks to Newton, we can also estimate the altitude above the tarmac that the Tesla achieved at the peak of its flight path. Newton tells us we can calculate the distance an object travels under a constant acceleration (like the acceleration due to gravity) over a certain amount of time. In this case, we know how long it took the Tesla to go from the ground to the peak height of the jump and back to the ground. That's just the 0.70 seconds I measured in the video. Here, h is the height, g is the acceleration due to gravity (9.8 meters/second2), and t is the time. The asterisks (*) are the multiplication symbol. ...or almost exactly two feet off the ground. If you pause the video midway through the jump, that looks about right. Thanks to a little algebra and bits of data, we can put some precise numbers to the news. All in all, it was an impressive, and impressively reckless, feat; I can't imagine how horrific it would have been had another vehicle or pedestrian been in the way at the time. Many stories about the flying Tesla have noted that it's a high performance electric car that can go from zero to sixty miles per hour in 2.5 seconds. That is indeed a super-car level of acceleration, but it's of no importance to this incident. What mattered was his speed as he launched from the railroad tracks (216 kph, or about 130 mph). My little hatchback could do that, if I were crazy enough to go to Barrie and try it...which I'm not.